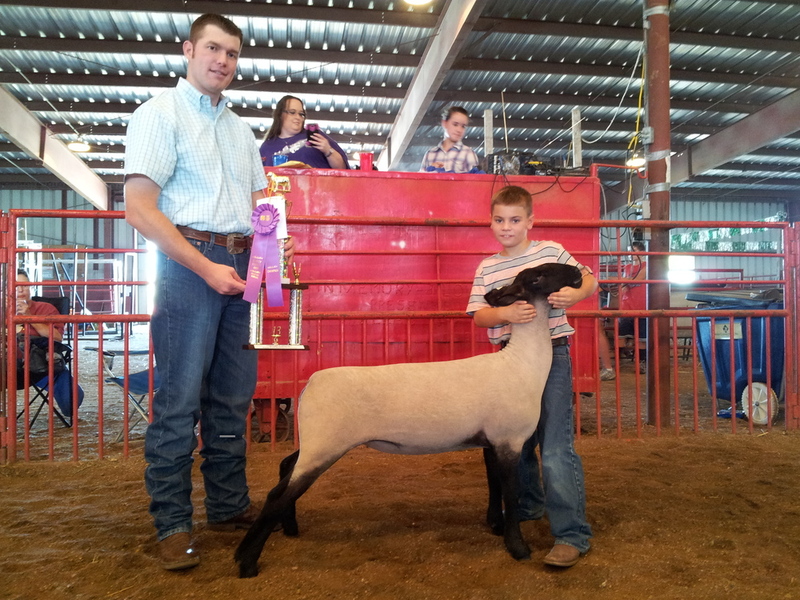 Nine-year-old Clayton poses with his championship breeding ewe at the Harvey County, Kansas, fair. He won two championships that day. Clayton, a nine-year-old who lives near Newton, Kansas, has his own flock of sheep. He comes from a family of shepherds--he's fourth generation. He became further engaged with sheep when, at age five, he showed a lamb at a county fair for an older friend. He won a prize for his friend, but most of all, the lamb won Clayton's heart. I have written a story about Clayton and his favorite lamb, which I've named Smokey. It will be published October 12 in a newly formed England-based online children's magazine called AlfieDog. I have fictionalized Clayton's story as he wins Grand Championship with Smokey at the county fair, and then I tell what happened to the lamb after the prize. Traditionally, a show lamb is sold, fattened up a bit, and shoved to slaughter. I wanted to highlight the dilemma. Does Clayton sell his lamb or find a way to spare his dear friend's life? He found a way to do both! How are lambs prepared for showing? What do they eat? What are the traits that make them pets? These questions pointed to the research I did as well as suggested questions for interviewing Clayton. I learned that Clayton worked with his lamb daily. He taught her to stand quietly, plant her feet in a square position, and hold her head high. He fed her special mixes of grains--corn and oats. He played with her, romping in the pen, head butting each other, as well as enjoying quiet times of sharing secrets. Clayton's a special little boy, proud of what he has done, and rightly so. This summer his show lamb won Champion Breeding Ewe and he was named Champion Junior Showman at the Harvey County Fair. Great honors for someone so young. No fiction there. My project included a thorough look at a boy's life on a Kansas farm in a rural school setting. Clayton attends a charter school that incorporates the care of farm animals. Each elementary class is assigned one group of farm animals. Clayton loved his sheep assignment last year. He also remembers the year (first grade) when his class had the school's flock of chickens. They gathered eggs, candled them, and prepared them for sales to school visitors. They calculated income and expenses for a math unit. That was great for Clayton, but he preferred the sheep year. This year his class is focused on fiber arts--spinning and weaving sheep wool. He loves it. During a heavy mid-winter blizzard last year, Clayton insisted his mother take him to school so he could check on the sheep, feed them, and make sure they were sheltered. He already was learning how to care for his own flock, which he now has and enjoys daily. I wish Clayton and his family the very best as he progresses with his flock of sheep. I'm confident he will do well and continue to excel because of his hard work, his knowledge, and his many supporters, including me. This is my public way of thanking Clayton and his family for their time and interest in helping me tell this story.